Greatly influenced by the music of Django Reinhardt, Taiwanese-Canadian guitarist Denis Chang is the only musician in Canada to appear on Hot Club Records, the Norwegian based Gypsy Jazz label famous for having discovered the likes of the Rosenberg Trio, Jimmy Rosenberg, Angelo Debarre, Andreas Oberg, etc. He has performed in festivals across the USA, Canada, and Europe with renowned jazz musicians such as Bireli Lagrene, Angelo Debarre, Stochelo Rosenberg, Mark O'Connor, Joscho Stephan, James Carter, Les Paul, Frank Vignola, Andreas Oberg, Dorado Schmitt, etc. Denis is also renowned as a producer of music instructional videos. The DVDs he produced for Canadian publisher Hyperhip Media have sold well over 8000 copies since 2007. In 2011, he created his own online instructional video website DC Music School that now boasts over 15,000 registrations from well over 60 countries. 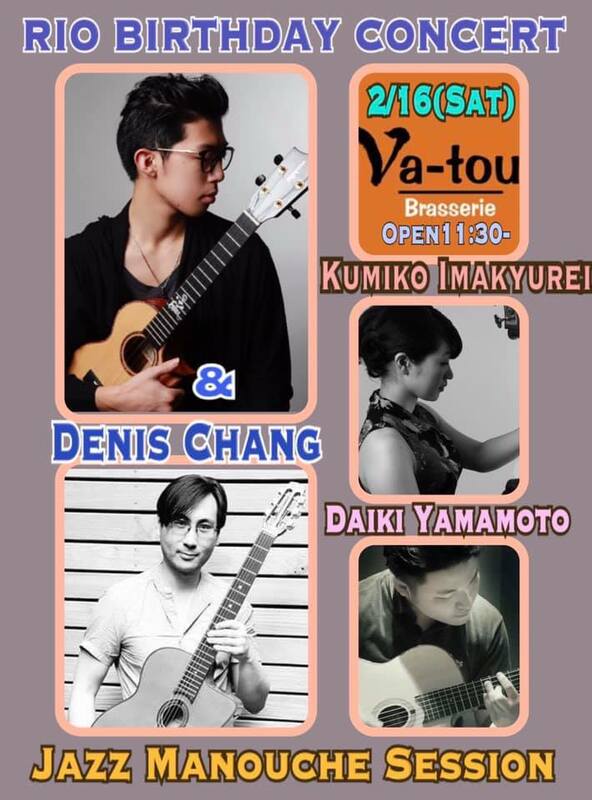 Daiki Yamamoto is the first generation to play Gypsy Jazz from young age in Japan. He learned a special technique on “La Pompe” from famous rhythm guitarist Mathieu Chatelain, Performed and recording with Antoine Boyer, Denis Chang, Sotaro Kitatoko, Toshihiro Nakanishi. Based in Tokyo and participating several project, Asia International Gypsy Jazz Unit, Kitatoko Sotaro Gypsy Jazz Unit, Tokyo Manouche Trinity. He performing in famous Gypsy Jazz festival in Japan every year, Django Tokyo Festival, Niigata Gypsy Jazz Festival, Sakura Django Reinhardt Festival. He is well known not only an authentic rhythm guitarist this kind of music but also a lead guitarist. She takes on double-bass at the Modern Jazz Society of Musashino art university in her age20, and later discovers Django Reinhardt’s music. she went to France to visit the Django Reinhardt Festival in Samois sur Seine. It motivated her to dedicate herself to this music. In Japan, she has been playing in many gipsy jazz units. On the other hand, In order to touch the authentic gypsy jazz and culture, she crossed Europe. She joined the jam sessions and interacted with the musicians. She studies Rhythm guitar under Fapy Lafertin. she has been hosting jam sessions. She also participated in the recordings of gypsy jazz bands such as Daisuke Teshima Trio (2011) and Oriental Shuffle (2015). In 2016 she recorded ‘Tokyo Session’, a French-Japanese collaboration with Edouard Pennes and Rémi Oswald. 17-years-old ukulele prodigy, RIO has performed at music festivals throughout Asia, in notable U.S.A. venues as far away as New York City and Honolulu and well known in the TEDx community. He captured a 1st place at Amateur Night at Apollo Theater in New York City, also received the Award of Excellence at the Diner's Club Social Jazz Session in 2013-14. His first album “I~around ~” got nominated for the 39th Na Hoku Hanohano Award known as Grammy Awards in Hawaii and also an official KAMAKA Ukulele Artist.